Cook the quinoa according to the package. Preheat the oven to 350 degrees. 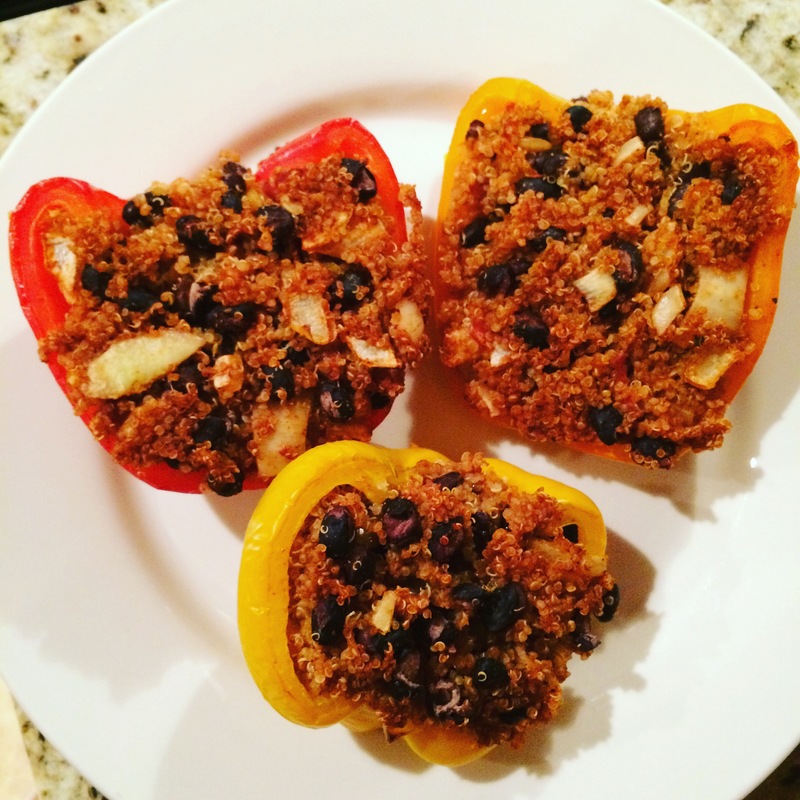 Place the halved peppers in a glass dish (sprayed with Pam or coconut oil). Mix all of the other ingredients in a large bowl and combine with the cooked quinoa. Stuff the peppers with the mixture and cover with tinfoil. Bake for about 35 minutes on 350 degrees in the oven. Remove foil and cook another 10 minutes. Top with some more salsa or sriracha and enjoy! Summer is upon us and there is nothing better than a refreshing, tropical fruit smoothie. This smoothie has banana, pineapple, kiwi, strawberry, mango, honeydew, cantaloupe, and spinach all blended with coconut water. If you always blend your smoothies with almond milk or some other type of milk, try blending it with coconut water. It lightens the smoothie up and adds a delicious flavor, as well as a host of nutritional benefits. Coconut water has a ton of health benefits. It’s a sterile source of clean water and great for hydration. It makes a better sports drink than commercial products because it’s lower in salts and sugars, but higher in potassium. It contains glucose which gives you energy, vitamin C which helps the body against several ailments, and vitamin B, which helps aid in the replacement of worn out tissues. 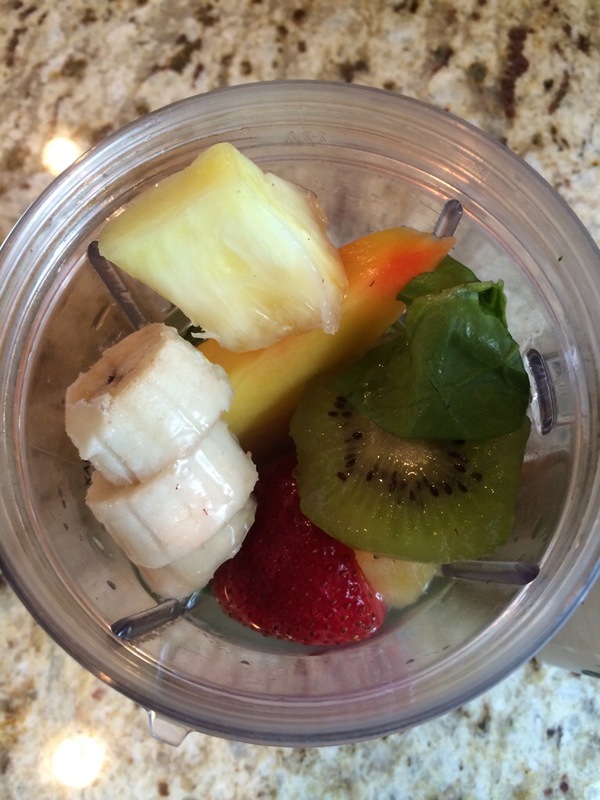 So blend one of these tropical smoothies and enjoy it post workout to rehydrate your body! 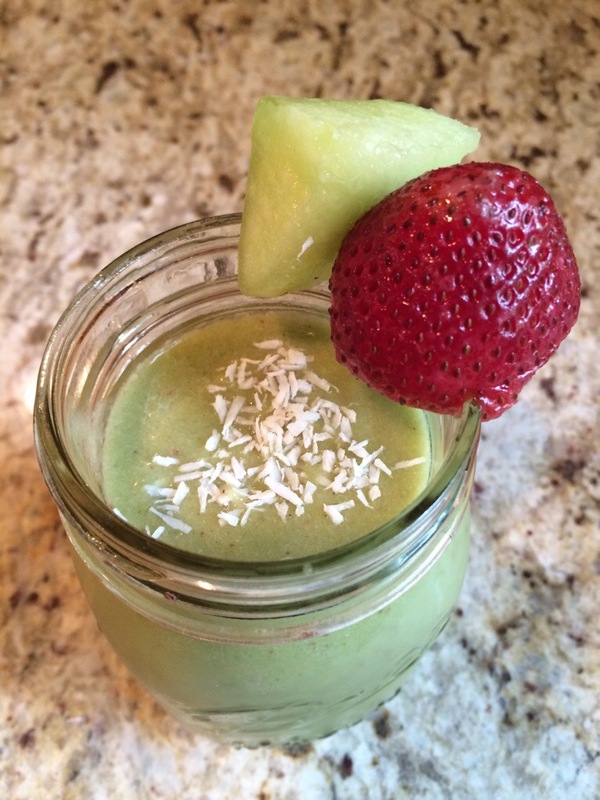 Blend all ingredients in a Nutri-bullet or blender and top with organic coconut shreds.